We return to a fun restaurant on the Peninsula! San Francisco’s most famous hotel is the perfect venue for celebrating the end of Winter! Silverado Trail &amp; Hike, Deer Park Rd, St. Helena, north of Napa. 10:15am – 4:30pm. Originally scheduled for March 2, but postponed because of rain. One of the most fun party themes of the year! Spring has sprung! Celebrate at one of our favorite waterfront venues! 10:15am-5pm. Meet at the Wildflour Bread Co. in Freestone between 10-10:15am. Shuttle to a hidden location. This great hike is short, but beautiful. Our wine picnic will be at a location in the forest. Then we do an underground tour, with movie and tastings, at an historical winery. 10am-4:45pm. 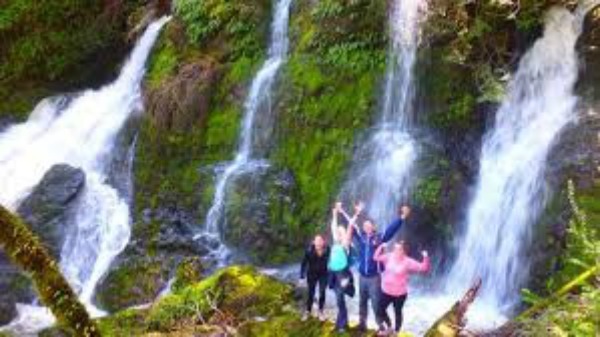 Redwood Forest &amp; Waterfall Trek, plus Underground Winery Tour and Tasting. Meet at Korbel Winery in Guerneville. Spice up your Sunday afternoon with a fun party at Faz at the Four Points by Sheraton Hotel, 5121 Hopyard Road, Pleasanton. 4-6pm.